Tired and hungry after camping in Washington’s Olympic Peninsula, we were in search of some quick comfort food. Back in Seattle, we found a Chinese noodle shop less than half a mile from our hotel, so we headed in that direction. 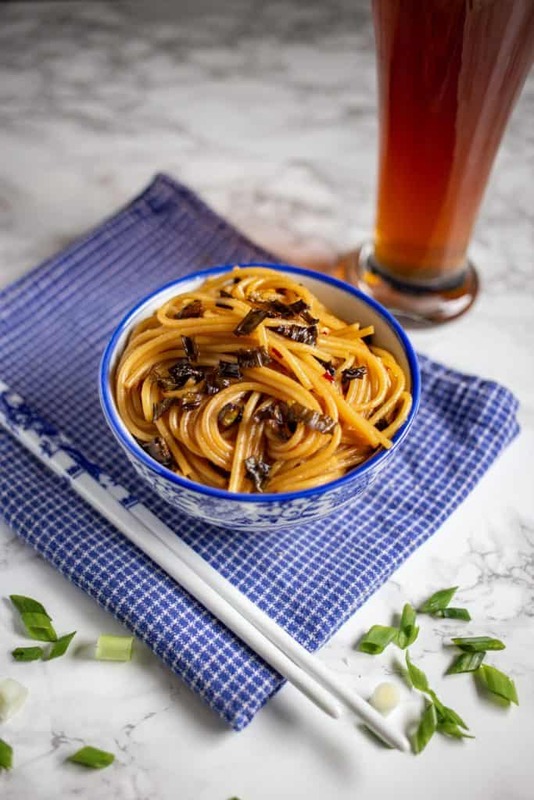 Chinese noodles may not sound like comfort food to everyone, but after living in China for more than 3 years, noodle dishes bring me back to the street stands and tine hole-in-the-wall restaurants in the alleyways of Nanjing. The menu of Zheng Cafe is as small as the restaurant, only a few steamed bun and noodle options, but they all sounded amazing. We sat overlooking the kitchen and struck up a conversation with owner Greg Wetzel while waiting for our food. He had taught English in Wuhan several years earlier. 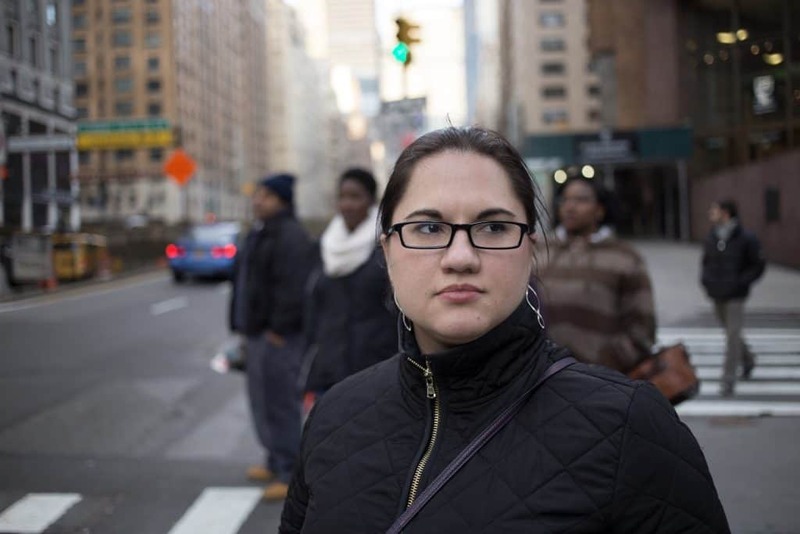 When he returned to the States, he went to culinary school and met his sous chef there. They started Zheng Cafe as a food truck first, but they had recently opened the brick and mortar location and were still only open 3 days a week. My bowl of scallion noodles (cōng yóu miàn 葱油面) was warm, flavorful, authentic, and the slightest bit spicy. So good that I wanted to figure out how to make it at home. I knew that I would use spaghetti as the noodle base instead of making hand-pulled noodles – that’s a trick I learned from Greg. It was the sauce that I had to perfect. I tried with many different ratios of oil, soy sauce, scallions, and pepper flakes and finally came up with a reliably tasty and flavorful bowl of noodles. 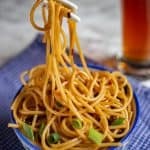 Even if these ginger scallion noodles don’t bring back memories for you, I hope you enjoy the flavor as much as I do. Start by bringing water to a boil and cook the spaghetti noodles according to package directions. Make sure to set a timer on the noodles if you tend to get distracted in the kitchen like I do – mushy noodles are not the goal here! When the spaghetti is done, drain and return the noodles to the saucepan. While the water is heating up, add the oil to a small skillet and heat over medium heat. Add the scallions and cook until brown. You’ll only need to stir occasionally – this should take 10 to 15 minutes. When the scallions are brown and crispy, move them to a separate bowl using tongs or a soup ladle. Place the skillet with the oil back on the burner and add the ginger. Cook for about 30 seconds and then add the brown sugar, soy sauce, and red pepper flakes. Cook for one to two minutes until the brown sugar has dissolved. 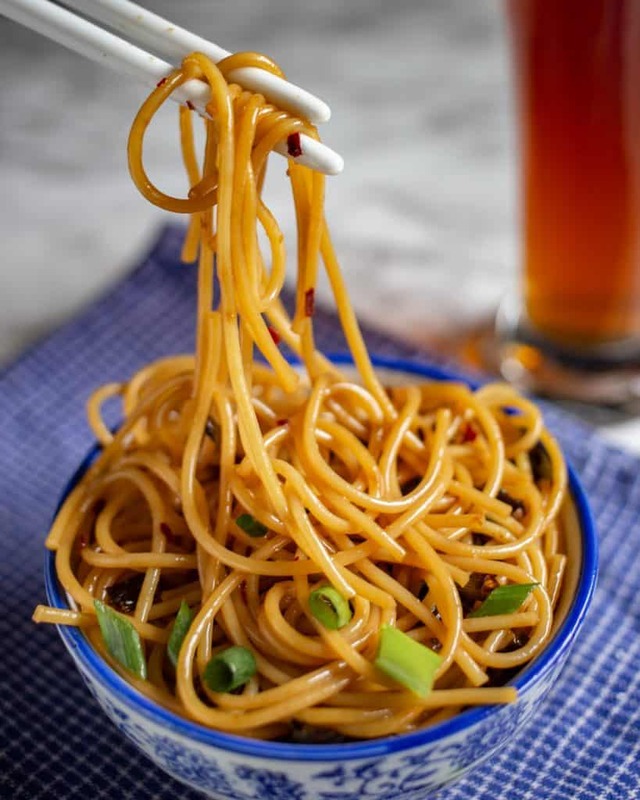 Pour the sauce on the noodles in the saucepan and add the crispy scallions (keep a few aside for topping the finished bowls), then mix together with chopsticks or tongs. Serve with the reserved scallions. I love this nonstick frying pan (I used the 8-inch pan for this recipe) – it’s perfect for frying the scallions and also equally good for eggs and other delicate ingredients. Silicone tongs make it easy to take out the finished scallions and mix together the noodles and sauce without damaging the noodles. If you try this recipe for ginger scallion noodles, leave a comment and review below and let me know how it worked out for you! Looking for more Chinese recipes? Try this recipe for Sichuan eggplant. Bring a medium saucepan filled with water to a boil. Cook the spaghetti noodles according to package directions. Drain when done and return to the saucepan. Add the oil to a small skillet and heat over medium heat. When hot, add the scallion. Cook, stirring occasionally, until the scallions turn brown, about 10-15 minutes. Remove the green onions with tongs or a spoon and move to a separate bowl. Return the skillet with the scallion oil to the burner and add the ginger. Cook for about 30 seconds, then add the soy sauce, brown sugar, and red pepper flakes. Cook for a minute or two until the brown sugar dissolves. Pour the sauce over the noodles. Keep a few scallions aside for topping the finished bowls. Add the rest of the cooked scallions to the saucepan and mix the sauce and scallions with the noodles using tongs. Serve the noodles in bowls with the reserved scallions. 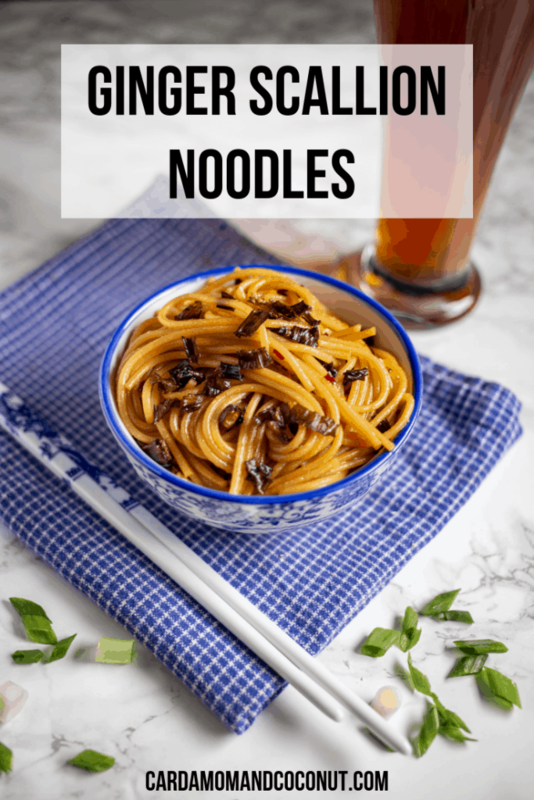 This is such a creative noodle recipe! wow these noodles are making me drool all over my keyboard!! Pinning to try later! 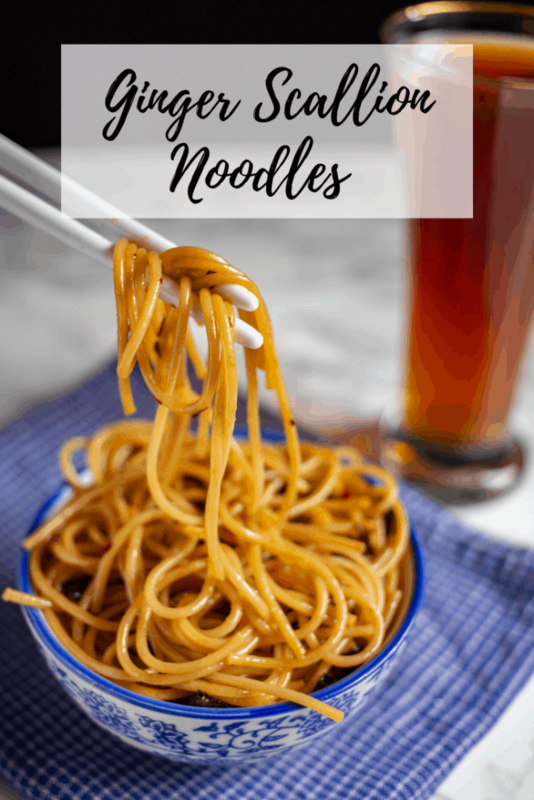 Love how easy these noodles are to make! Great idea for a quick weeknight dinner! YUM! These noodles look so flavorful! What an easy and delicious meal! It’s perfect for a light lunch! I need to try these noodles! The scallions look like the perfect complement to the ginger sauce. Okay, I need to make this like, yesterday! This looks absolutely incredible! Excellent! Enjoyed these tonight with kimchi dumplings. Made exactly two adult dinner portions. Maxed the dried chili and it had a nice spice. Could use even more green onions next time, used a little over a cup. Easy, fast and tasty! Could imagine the noodles would be good with a small amount of ground pork in the ginger, pepper mix. Thanks, Kristi! I agree with the green onions, every time I make it I add a bit more and it’s never been too much! I’ve made with shrimp on top before, and I’m guessing that ground pork would be great too. I can’t believe I’ve never tried making this–I’m definitely gonna need to try it soon! It looks delicious! :]!